Tom Brady Still not Top 5? With a sixth Super Bowl appearance and a fourth victory Tom Brady capped off a strange season in the best way possible. Last summer I wrote a piece for ESPN Insider that made the case that Brady was in decline. The headline of the piece was ‘Tom Brady is no longer a top-5 QB’ and while that isn’t the headline I would have run with (I knew it would piss people off, and it wasn’t the point I wanted to lean on), I did know that’s the point they wanted to make and felt I could defend it. People accused the article of being nothing but clickbait, and while there is certainly an element of that (isn’t every article put up done so with the aim of getting people to read it? ), I felt that the numbers, and more importantly the tape, showed a player on the decline. At Brady’s age that is inevitable at some point, and getting out in front of it could only make for a good piece. Needless to say it blew up. It consumed the NFL world for a while, appearing all over ESPN and anywhere else that covered the league. Anybody who talks football likely had to address it at some point during that week. For that I apologise! It was not met with much agreement. “Idiotic ESPN report claims Tom Brady…” began one of my favorite response pieces. The start of the season looked like it was vindicating the article and the logic behind it. The offensive line – a perennial strength on New England – was performing terribly in the wake of the departure of longtime OL coach Dante Scarnecchia. Brady looked uncomfortable, was struggling under the constant waves of pressure, and was beginning to miss routine passes even when he was kept clean. Clearly it wasn’t all his fault, but the Tom Brady of September was not a Top 5 QB. The Tom Brady of September was playing like crap. After the Chiefs game I broke down his struggles further in my Analysis Notebook feature on PFF. Little did I know that Chiefs game was about to make the turnaround in the Patriots season. From that moment on the entire team picked itself up, dusted itself off, and set about what it needed to do to become a force this season and win a Super Bowl. Brady had become visibly irked dealing with the questions about his play and there were even people talking about benching him before long for Jimmy Garoppolo after he hadn’t played late in the game against Kansas City. “I also believe that he has more than enough talent and ability left to succeed this season and is quite clearly the Patriots’ best chance to win games. Those people mentioning a quarterback controversy are crazy”. What I never saw coming was the totality of his turnaround following this game. I had left the door open for an uptick in form but if I’m honest I didn’t see him playing back at a truly elite level during the 2014 season. He might not continue to struggle as badly as he had been, but he wouldn’t return to the vintage Brady of old. But that’s exactly what he did over the next month. A month, and about a thousand tweets on my timeline dragging up the old ESPN article, later I was forced to address the whole thing again with this Analysis Notebook. This interactive chart (which I can’t seem to get working – click on the image) showed the kind of turnaround we were talking about from the first month of the season to the second. Even that piece though threw a lot of the credit on a healthy Rob Gronkowski and probably did Brady a disservice for how complete his reversal in fortunes had been. 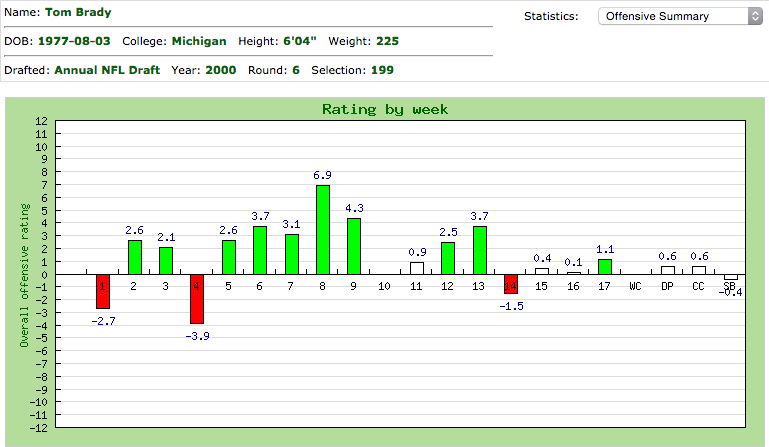 Having a healthy Gronkowski on the field will help anybody out, but Brady was playing a lot, lot better. He still wasn’t perfect, and there were still missed throws, poor reads etc, but we were clearly looking at a guy who was back on the Mount Rushmore of NFL quarterbacks after slipping off it earlier in the season. What about the next few months though? Brady’s play remained elite for another month but quietly began to slip a little in the final month of the season and even into the playoffs. Then we come to the Super Bowl, and perhaps the most interesting game of his season. The Patriots came into that game with the perfect game plan to defeat the Seahawks. Seattle is so good at what they do on defense, and so perfectly tailored to shutting down a regular NFL offense that the only way to attack them is in excruciatingly small increments – death by a thousand papercuts. I thought the Broncos had a chance to do that the year before, but the way that game began put them on the back foot immediately and they never got into the swing of it. The Patriots on the other hand immediately came to play using exactly that method. They had to be patient and happy with a four yard pass every down. Drives were going to take a long time to generate any points, and there may be no better quarterback in football at remaining patient and taking those ‘nothing’ plays every single snap. The way the game ended and Brady’s performance in the fourth quarter though conveniently allows people to forget entirely about his ugly interceptions earlier in the game. Those weren’t Brady losing patience, but simply awful decisions. He has not done well under pressure for some time now, which was one of the key points in the original ESPN article, and the Patriots were fantastic at ensuring he didn’t have to deal with much of it during the Super Bowl and for much of the season. Brady had the ball out of his hands on average in 2.39 seconds this season, quicker than everybody except Peyton Manning. In the Super Bowl that figure was even quicker – averaging 2.24 seconds, 1.45 seconds per play faster than Russell Wilson on the other side. When he did get pressure though Brady made some big mistakes. All too often we define a player’s performance by the result at the end. This game essentially came down to a huge play by Malcolm Butler, an undrafted cornerback on the Patriots defense. One play that had nothing to do with Brady will be used by people who want to argue his greatest of all time legacy whichever way it went. If Butler got beat on the play Brady would have lost his last three Super Bowl appearances and would be more than a decade from his last touch of the Lombardi Trophy. Butler makes the play and people want to claim there isn’t even a discussion about who is the greatest ever – it has to be Brady. The greatness we define players by can be contorted by such arbitrary things. In fact if you look at the knife edge that Brady’s entire career has navigated in terms of success and failure you can swing the results massively by altering just a few plays that he didn’t have anything to do with. A missed kick here or there and he loses rings and a freak catch here or there and he finds more in his collection. We have to look at the player by what he did, not by the outcome of the game. Brady’s performance in this game was a mixed bag, but still showed his greatness. He made some huge mistakes, but he was executing one of the toughest game plans to succeed with against one of the league’s most imposing defenses. Brady was asked to make the right decision and not screw things up 51 times with the ball in his hands, and while he didn’t quite hit that perfection, he did make the right call most of the time, and was money in the fourth quarter when the game was in danger of slipping away. The bottom line here is that performance, form and legacy are all fluid concepts. Every word written about Tom Brady or any other quarterback is just a snapshot in time until he has hung up his cleats for good. A year ago his play looked like it was on the way down. His performance was slipping and he entered the season playing poorly. After week four he played for two months of the season as the best quarterback in the game before ending it with another two months of good if not mind-blowing play. Even in the Super Bowl we saw the very best of him along with the very worst at different points, but we also got to witness the culmination of one of the greatest comeback stories in sports. 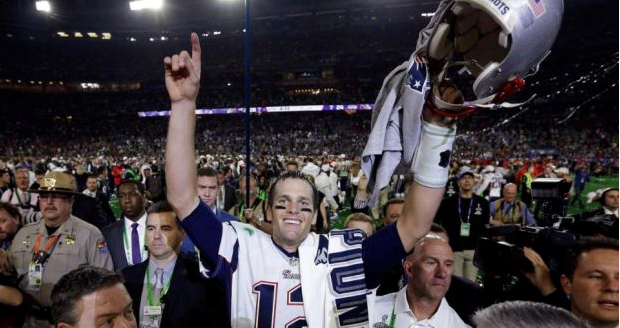 Tom Brady came back from a point of being written off by many all the way to winning another Super Bowl, one which cements his legacy as the greatest to ever play in the eyes of many. I for one certainly did not think he had that kind of play left in him. I though we might see him improve, and we could see the Patriots in the playoffs and contending yet again, but I didn’t think they or he had what it took for that final push to the summit. It’s been a while since I addressed the whole Brady saga, and given the twitter messages that still appear on my timeline, it’s probably about time I addressed once more, hopefully for good. Was Brady a top 5 QB entering the 2014 season? I’m not so sure. Was he by the end of the season? Absolutely, and that was enough to hoist another Lombardi Trophy, which is all that really matters.